Those types have always been seen on big-city streets, talking to themselves, asking and answering, shouting, speaking in a low voice, deliberating and pontificating. As children, we were afraid of them. They were “crazy.” That’s exactly what Israeli public discourse is like. We are talking to ourselves, inventing bogus axioms and sticking with them as if they were decreed from on high, convinced that the whole world accepts them. But we are only talking to ourselves. No one else accepts them. The Israeli collective is not only talking to itself, it’s deceiving itself completely. Jerusalem is a perfect example of this. It’s a neglected city, filthy and in parts frightfully ugly, stricken by poverty and ignorance. Nationalist, religious and social tensions are tearing it asunder, and part of the city is under the burden of occupation with all its most violent characteristics. The purported education, culture, openness and prosperity – far from the actual situation – are the locus of our national aspirations. It’s a capital city which not a single country in the world recognizes, but it’s “our eternal capital,” in the words of the prime minister. It’s a relatively marginal city, certainly when compared to Tel Aviv. From many standpoints it’s a city on the margins which secular Israelis don’t exactly flock to for a good time. It’s a city even the prime minister preaches about. But he doesn’t practice what he preaces when he flees the city for the weekend, whenever he can. It’s the “heart of the nation,” but a city that has gradually become the city of the ultra-Orthodox and the Arabs, society’s two poorest minorities. It’s the “rock of our existence,” but a divided and dismembered city that has in our deceptive words become “united Jerusalem.” It’s a city whose political future is more enshrouded in uncertainty than any other in Israel, but it’s “ours forever and ever.” So this discourse, which is accompanied by plenty of self-deception, is being conducted among ourselves, only ourselves. 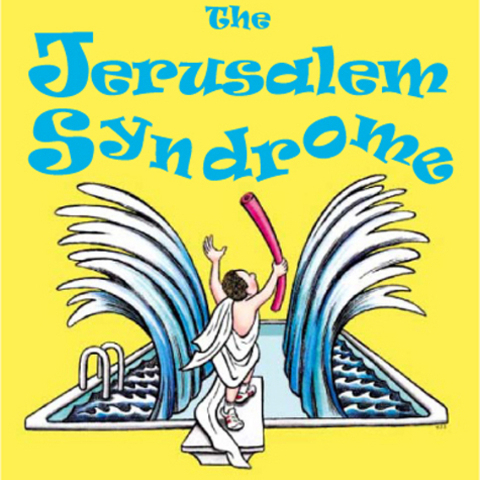 The Jerusalem syndrome has taken hold of us all. Jerusalem’s borders are also deceptive. Regarding religious and national feelings toward the Old City, there did not have to be a connection between religion and sovereignty, as Uman in Ukraine is also holy to many Jews and no one talks about imposing Israeli sovereignty there. So it’s hard to understand which national and religious feelings are being addressed here amid the city’s ever-expanding area, east and west, north and south, beyond recognition. What is the connection between the city’s Gilo neighborhood, which is closer to Bethlehem’s Church of the Nativity than the Western Wall, and the sanctity of Jerusalem? What about remote Pisgat Ze’ev and eternal Jerusalem? What’s the connection between Jewish Jerusalem and the Shoafat refugee camp? And how can Prime Minister Benjamin Netanyahu make the artificial distinction between construction in Gilo and Har Homa (which are within Jerusalem’s current municipal borders) and Ma’aleh Adumim, just beyond the city limits on the West Bank? Why is it not possible to freeze construction in Gilo but it is possible in Ma’aleh Adumim? So why not extend Jerusalem’s municipal boundaries to Hebron, the Dead Sea, Ramallah and Ramle? Why not build there recklessly and declare all this our capital? And the prime minister has told us other lies, such as “our commitment to protect freedom of worship for all the religions in Jerusalem, and to ensure fair and equal treatment for the city’s residents, Jews and Arabs alike.” Freedom of worship? It’s a sad joke. In no other city is access to holy places restricted according to the believer’s age, as Muslims who seek to pray at the Al-Aqsa Mosque are restricted. Fair and equal treatment? When, if ever, did Netanyahu visit the Palestinian neighborhoods of the beloved city? Israel of course can continue to talk to itself and lie to itself, to decide that not just Jerusalem but also the Jordan Valley and Golan Heights are Israel’s forever. It can decide that its inhabitants are not “settlers” but “residents,” as they have always called themselves, and that these are not at all occupied areas. It can decide that “settlement blocs,” another Israeli creature, are “at the heart of the national consensus”, as they are now being defined without any basis in fact. It can decide that the current route of the separation fence is the real international boundary. We can talk and talk to ourselves, like the crazies who walked around the streets of my childhood, frightening us very much.